Despite officially ending in June 2009, the Great Recession and its aftermath continues to have a damaging effect on the labor market prospects of young adults. The depth of the recession and the slow pace of recovery since it ended means that seven classes of students have now graduated into a weak labor market and have had to compete with more experienced workers for a limited and slowly growing pool of job opportunities. Recent improvements in economic conditions have begun to finally translate into better job prospects for young graduates, but there is a long way to go before we return to the labor market health of the pre-recession period. 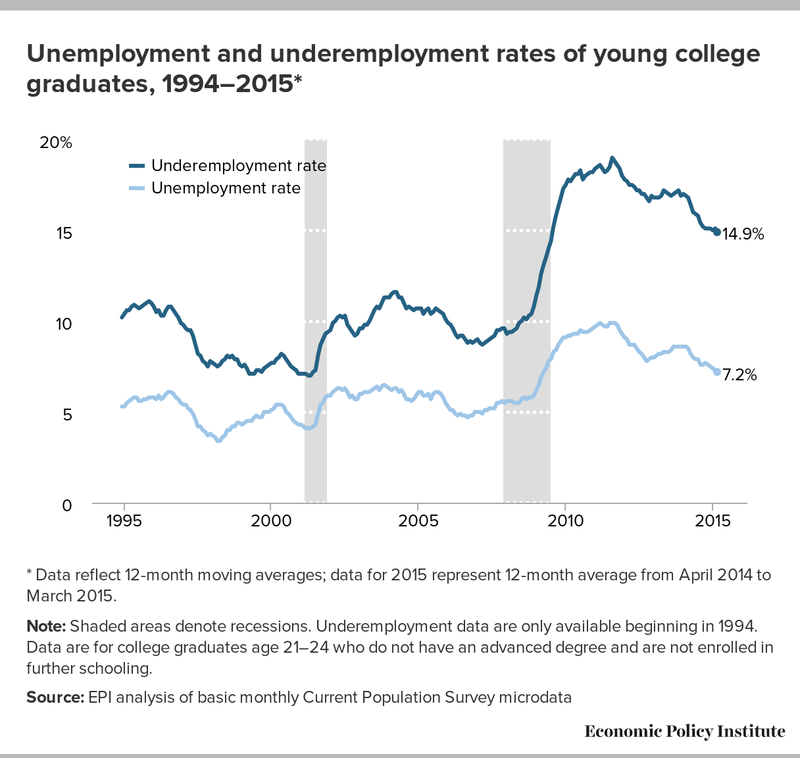 Although the labor market is slowly recovering, unemployment remains elevated for both young high school and college graduates; underemployment rates for these groups are also unusually high. As seen in the charts below, the unemployment rate is 7.2 percent for young college graduates and 19.5 percent for young high school graduates. Although these rates have come down from the peaks after the Great Recession, they are still elevated above their 2007 levels (5.5 percent for college grads and 15.9 percent for high school grads), which were already high compared to the more favorable rates seen in 1995-2000. The Class of 2015 joins a sizable backlog of unemployed college graduates from the last six graduating classes (the classes of 2009–2014) in a difficult job market. * Data reflect 12-month moving averages; data for 2015 represent 12-month average from April 2014 to March 2015. Note: Shaded areas denote recessions. Underemployment data are only available beginning in 1994. Data are for high school graduates age 17–20 who are not enrolled in further schooling. Further, the headline unemployment rate may understate continued weakness in the labor market. A more comprehensive measure of labor market slack is the “underemployment rate” (officially, the U-6 measure of labor underutilization). In addition to the unemployed (jobless workers who report that they are actively seeking work), the underemployment rate also includes those who work part time but want full-time work (“involuntary” part timers), and those who want a job and have looked for work in the last year but have given up actively seeking work within the last month (“marginally attached” workers). 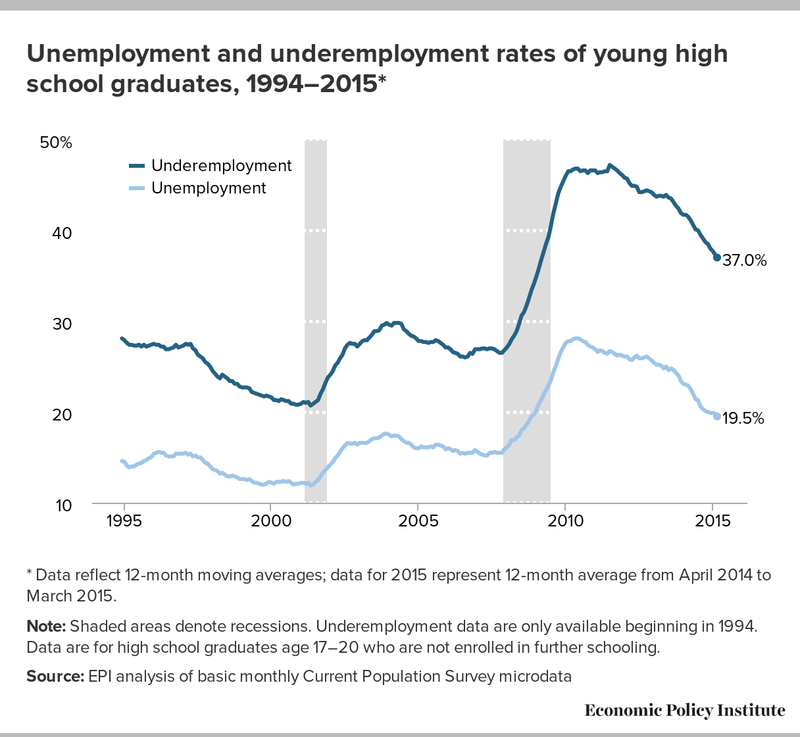 The underemployment rate is 14.9 percent for young college graduates and 37.0 percent for young high school graduates. These numbers are elevated compared to their 2007 levels (9.6 percent for college grads and 26.8 percent for high school grads), which is a sign that many young graduates either want a job but have simply given up looking for work, or have a job that does not provide the hours they need. Underemployment remains particularly high compared to its pre-recession levels. The ratio of the underemployment to unemployment is near the highest it’s ever been for young high school graduates and college graduates, (1.9 and 2.1, respectively). The wide gap between unemployment and underemployment suggests that the lack of opportunities are either forcing young people to drop out of the labor force or take part-time jobs while they look for full-time jobs. Note: Shaded areas denote recessions. Underemployment data are only available beginning in 1994. Data are for college graduates age 21–24 who do not have an advanced degree and are not enrolled in further schooling. These data will be featured in our forthcoming paper, “The Class of 2015,” which will explore the economic prospects of recent young high school and college graduates in more detail. We’ll analyze employment, enrollment, and wage trends in order to glean what kind of job market and compensation young graduates will encounter upon graduation and as they start their careers. We will also look at how these trends differ across gender and race, as well as the implications on student loans and the cost of college.